Your helmet is an essential safety element of your welding equipment. This is one area in which you should not consider economizing. Yes, many helmets provide basic protection, but where the health of your eyes is concerned, only the best protection will do. Not only does your helmet protect your eyes, but it should cover as much of your face and neck as possible; there is no reason to incur damage while you are working. Sure, a few small burns are not much damage, but over time and with repeated injury, the damage can cause lasting scarring and other problems - there is no reason to risk that. 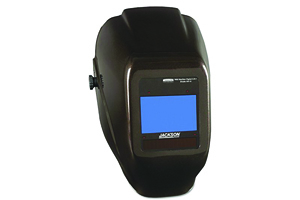 Jackson Safety Nitro Variable ADF Welding Helmet 1 Year $ Check Amazon for Best Price! Jackson W50 Series 3-N-1 Variable Auto-Darkening Helmet 2 Years $$$ Check Amazon for Best Price! Jackson Safety W60 Nexgen HLX 100 Welding Helmet 2 Years $$$ Check Amazon for Best Price! 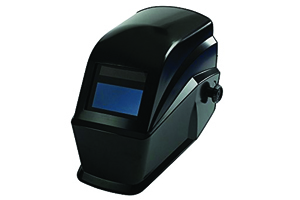 BH3 Auto Darkening Welding Helmet with Balder Technology 2 Years $$ Check Amazon for Best Price! The following are a few examples of Welding Helmets made by Jackson, a company that has been a leader in the business since 1947. 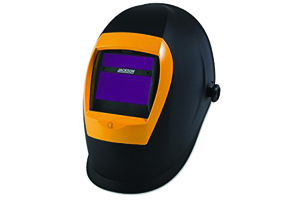 The Jackson Safety Nitro Variable ADF Welding Helmet(36633) is a good value for a basic helmet. Weighing only one pound when fully assembled, this black helmet includes variable shade features and sensitivity and delay adjustments. The shade is variable between 9 - 13. Select the sensitivity level at which you want to activate the shade and delay the release of that shade to your personal preference to protect your eyes as the light diminishes. This helmet is solar-powered, so just set it out in the bright sun for a while before you begin to work - a battery-free tool! This is an ANSI Z87.1 and CSA Z94.3 compliant helmet. The Jackson W50 Series 3-N-1 Variable Auto-Darkening Helmet (14990) weighs a full pound more than the Nitro (above) and offers a wider range of features. It has an amber view lens for better clarity of the weld puddle and can detect welds less than 5 amps. This solar-assisted unit requires 2 AAA batteries and has a low battery indicator. 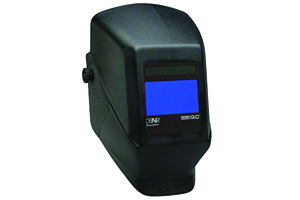 The 3-N-1 includes an auto on/off function and built in mag lens holder. The 3 functions mentioned in the name are weld, torch and grind modes. The 3-N-1 also includes the delay and variable shade settings mentioned in association with the ADF. It is also ANSI Z87.1 and CSA compliant. The Jackson Safety W60 Nexgen HLX 100 Heavy Metal Welding Helmet with Digital Auto-Darkening Filter (20501) also weighs in at about two pounds, but Jackson packs that two pounds with tons of features including the 3-N-1 (weld, torch, grind) function, amber view lens for better visibility and clarity of the weld puddle that also reduces eye strain and easy digital controls. The Nexgen HLX is powered by watch-sized batteries with solar assistance. This unit takes standard-sized cover lenses. This high tech beauty is available in fashion-forward colors that testify to its hot functionality. The top of the Jackson Safety helmets we are reviewing today is the BH3 Auto Darkening Welding Helmet with Balder Technology(37191), WH70. This filter lens (ADF) has the best EN379 ratings for optical clarity. With this helmet, you have remarkable sensitivity to light diffusion and can see at different angles. For eye protection, the BH3 includes variable shade range from 9 - 13 that provides shielding even during mig, tig, and arc welding. Weighing about two pounds, this solar helmet is versatile and provides protection for the face, forehead, neck and ears. The aerodynamic shape reduces heat build-up in the helmet and fights fogging. The huge selling point of the BH3 is the lens. It provides remarkable clarity, protects against eye strain and enables you to see the weld puddle and your project from any angle. The auto-darkening feature is wave-length specific. If you hold it up to the sun, it won't darken; but once you start your welding arc, watch it kick into action. The BH3 meets ANSI/ISEA Z87.1 +2010 standards for impact protection and welding use. It also meets DIN Plus standards for product quality. The BH3 has three headgear adjustments to meet the needs of your environment and comfort. Jackson Safety is a venerable name in welding safety products. The four helmets discussed here provide protection and application for different welding needs. Consider your work environment, welding projects and helmet needs before purchasing a helmet. All these are quality products; you just need to match your activities to the correct hood. The next consideration for selecting a helmet is the intended use. How often and how long at at time will you use your helmet? If you need to do occasional welding projects, you can consider heavier helmets, which are often less expensive. Heavier helmets are naturally less comfortable, but for short periods it is not a problem. However, if you anticipate more substantial welding projects, investing in a lighter helmet is advisable. You don't want to have to stop working in the middle of a project just because your neck is tired of holding up the helmet. Consider the size of the viewing area. Some helmets viewing area is very small. You may have to tilt your head at an odd angle to see your project. This may be acceptable for rare projects, but for regular use, consider your neck health as well as your eyes and find a helmet with a large viewing port to avoid compromising your neck. For those of you who do extensive welding, check out the modes available with the helmet to be sure to select one that has all the features you need. More features generally means increased price, but it is better to purchase a helmet with more features than than fewer. You may expand your welding needs as you become more experienced and purchasing a more versatile helmet enables you to widen your work without purchasing a new helmet. Additionally, helmets with more features are often better made to support those features.